Become a Digital Champion with our Training! Are you an organisation working with people in your community who are facing social exclusion? Perhaps older people, disabled people or those with low incomes. Do you want to help people to benefit from getting online by developing their essential digital skills? We know that 1 in 5 people in Scotland are lacking essential digital skills and are missing out. From being able to access services, socialising, saving money, staying healthy to learning new things. With your established and trusted relationships we know you’re well placed to help tackle this inequality. We can provide you with free training and access to Digital Unite’s Digital Champions Network to help your staff feel confident in supporting people facing digital exclusion. We’ll help to give you the skills to support your clients to get the most from being online. Don’t worry, you don’t need to be a digital guru; it’s all about your people skills. Through the Digital Champions Network you’ll get access to online training modules, learner guides and relevant resources. The One Digital Team will also provide face-to-face training along with follow up sessions and events to help support you. We can tailor our training topics where possible to best meet the needs of you and your clients. This could include topics such as accessibility, gaining employment, financial inclusion, health and wellbeing and communicating with friends and family. Our Digital Champions Training is aimed at third sector organisations who can commit to supporting their frontline staff and volunteers to become Digital Champions. This includes time for ongoing training and development and support to enable Digital Champion activities with clients. If this sounds like your organisation then we’d really like to hear from you! Ideally, this would be from a member of staff who has an overview of resourcing such as a Manager or Team Coordinator and can play a key role in working with us to create your organisations Digital Champions. The information you provide in this form will be stored to allow us to respond to your enquiry. Read our full privacy notice. 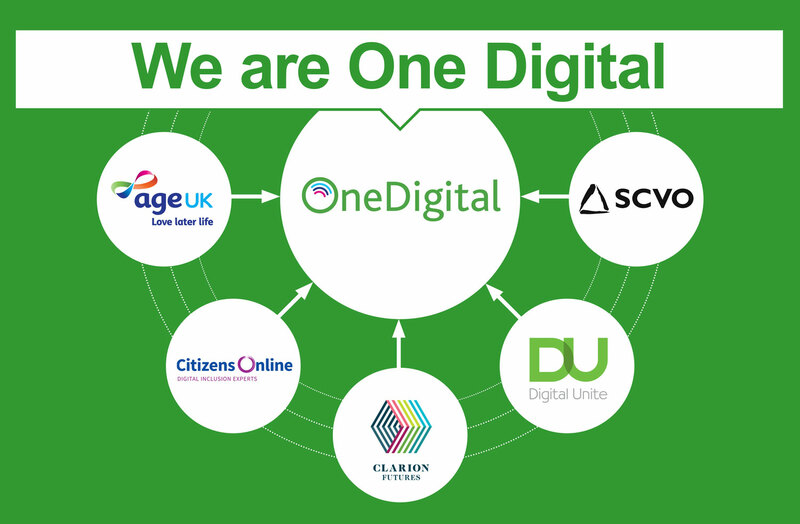 SCVO are part of the UK wide One Digital partnership, an exciting and unique Big Lottery funded collaborative digital inclusion programme. At the heart of One Digital is the recruitment and training of Digital Champions to deliver essential digital skills support to individuals who are digitally excluded. For further information on the programme please take a look at the One Digital website. Click on the One Digital infographic for a snapshot of the programme and its success to date.